After the media centered Samsung Galaxy S4 release and a strong simultaneous presentation of the HTC One in US and UK, it was time that LG held an event of its own. LG has sent out invites for a 1st May Event in New York that could certainly mark the release of their Phablet, LG Optimus G Pro. The Invite, to be honest, doesn’t give even a slightest of clue of what we might except at the event. 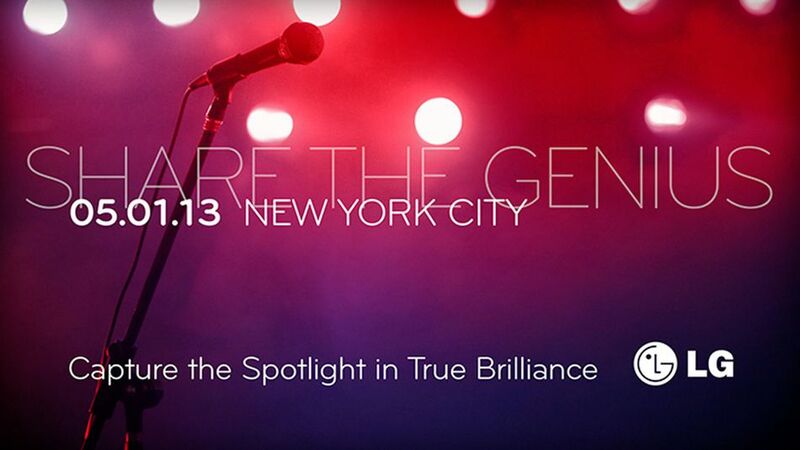 The line “ Share the Genius “ might state the G Series of LG Phones will be featured but that is vague. Our Prediction of the LG Optimus G Pro Announcement is based on the appearance of LG optimus G Pro on FCC and the fact that LG announced that the Galaxy Note 2 Competitor will come the by Q2. Adding to that, we can also be sure because there is currently no smartphone of LG being rumored which is big enough to get an event for itself. The LG Optimus G Pro has a 1.7 GHz. Snapdragon 600 processor 2 GB RAM and with a Adreno 320 GPU for smooth Graphics. The Device has a smashing 5.5 Inch screen at true 1080p mind boggling 440 ppi which gives Phones like HTC Droid DNA a run for its money.